I am quite sure it has been well over a month since I last blogged. I keep waiting for life to “slow down” (hahaha) so that I can do pretty much anything other than look up a recipe or facebook for a few minutes here and there on the internet. I have simply come to the conclusion that life just doesn’t slow down. Sure one thing will end, but it is always followed by another. Since the last I have posted, we have had an ER visit (we found out the hard way that our daughter who is now 14months is allergic to peanuts and cashews), we have had my husband’s wisdom teeth removed, and we have moved. The moving was very quickly done and we hadn’t planned on moving until next year, but our landlord (we live in a townhome “village”) offered us a deal that was for a three bedroom instead of the two that we were in and for $50 less a month. Long story short, we moved in about a week after they told us about it. So now that life is getting back to normal, hopefully I will be able to blog a little more often. Now, I’m not sure about where you live, but around here, it has been raining for a good two weeks. Not just raining, but lightening and thunder and wind and all that good stuff that comes with a big storm. I hear there have been several tornadoes in the Midwest, and so I guess I should be thankful that we live in the mountains and are only getting the storm part. This weather does not scream “almost-summer-the-pools-are-opening-next-week” to me, so we have been eating a lot of soups for dinner. For awhile now, I have been craving soup beans, but ALWAYS forget to soak the beans overnight. This morning I woke up, got my hubby off to work and decided that there has to be an easy way to cook dried beans without soaking them. After a little research online, I found out that you could either in a dutch oven, which I don’t have, or in a crock pot, which I do have. Then I went on to search out recipes that didn’t involve ham, and I couldn’t find one to my liking, so what to do? Make up the recipe. It has turned out amazing! 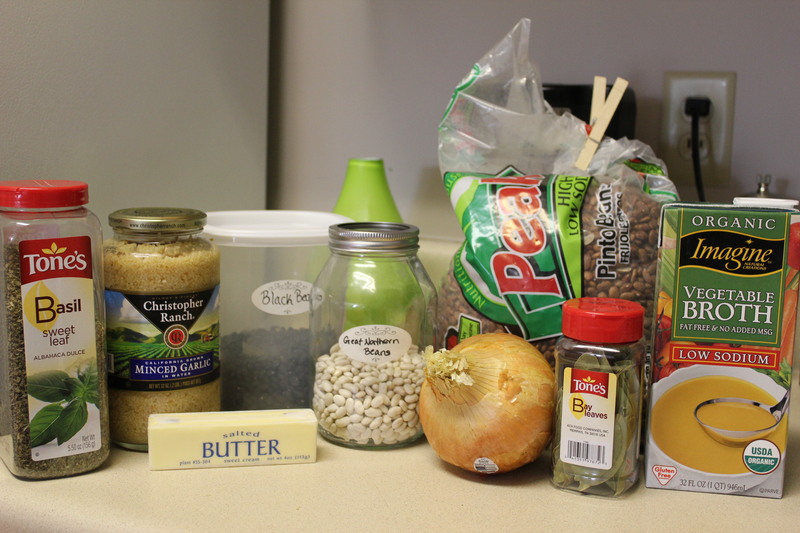 Ingredients: 1 cup each of the following, dried pinto beans, dried great northern beans, dried black beans. 6 cups of vegetable broth, 3/4 of a very large Vidalia onion thinly sliced, 1 Tbs minced garlic, 1tsp dried basil, 2 bay leaves, 1/2 stick of butter, and salt and pepper to taste. *Side note* This is very easy to make vegan. They only thing making this vegetarian and not vegan is the butter. I usually use a vegan butter, but in this instance it was easier for me to use real butter instead of a soy based product. I didn’t have time to take an in between photo because I was running out the door to have lunch with my hubby (the awesome thing about crock pots! have dinner ready when you get home!) but here is what you do….Throw it all in the pot except for the salt and pepper! Turn it on high heat for 6 hours, when the beans are tender salt and pepper to taste! Let me know how yours turn out if you try them, or if you added anything else to them. I think carrots would be a nice addition. Make them your own! Add all ingredients to a crock pot except salt and pepper. 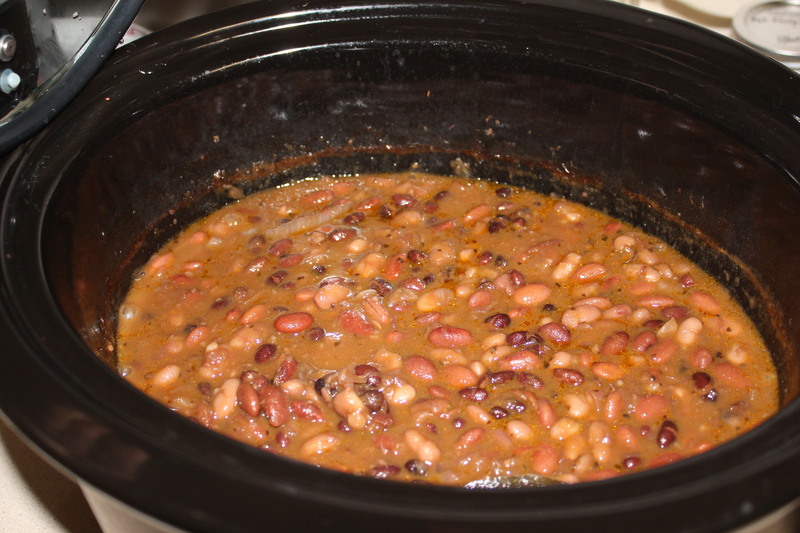 Turn on high for 6 hours, or until beans are tender. Once tender, salt and pepper to taste. Serve with corn bread, or rice, or if your from the north, add ketchup or whatever you like!